Whether you want to be scared out of your wits or ride a terrifying rollercoaster, there are plenty of Halloween events in London to choose from. London dungeons have stepped up their act this Halloween with not one but two scary rides. These bring you up close and personal with the capital’s most notorious and terrifying characters – The Torturer, Jack the Ripper, The Plague Doctor and Sweeney Todd. In fact, if you’re feeling really brave, why not try out the underwater ride – Drop Dead, where you escape from convicted criminals? Even better, the popular Séance is back. But the real question is, can you stand to stay in the Jack the Ripper show when the lights go out? Looks like diving champion Tom Daley did! The second one of our favourite Halloween events has been described as a ‘Hillbilly Halloween’ full of spooky characters. This is a fully immersive experience where you can get to meet Donald Trump’s No.1 fan, Patriarch Cletus. He’s flown the whole family over from the USA. They are spending Halloween on London Bridge to spread the word, but unfortunately, their word is more Chainsaw Massacre than godly. However, anyone interested in romance should keep away from cousin Bobby. He is in the market for a new bride. Just don’t ask about the old one who, sadly, came a cropper with his chainsaw. If you are a fan of scary films, what could be better than watching one in a spooky museum? For those that love classic horror movies, this is your chance to watch some brilliant films. Not only that, but the viewings are in the Hintze Hall, which just so happens to house the magnificent Blue Whale skeleton, measuring 25 metres. Guests also get free popcorn to enjoy and free entry to the hugely popular exhibition ‘Life in the Dark’. Notably, an intriguing look into the dark side of nature. 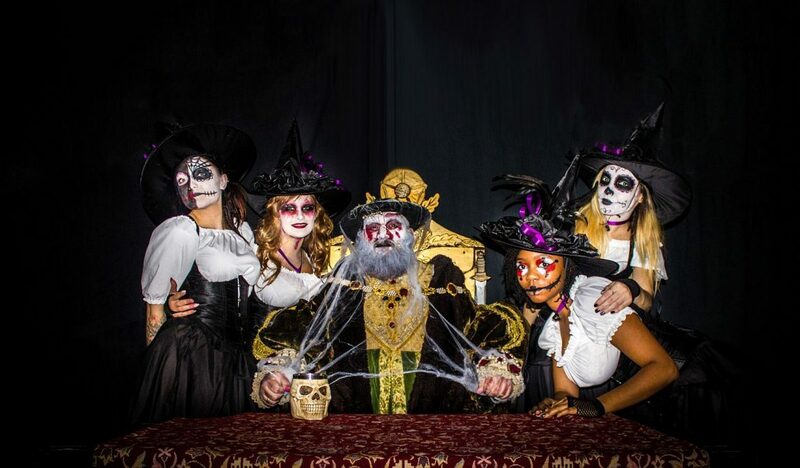 Celebrate Halloween medieval style in this underground space with witches, warlocks and weird jesters. Spooky characters put on an amazing show whilst you dine in style. You get to enjoy a four-course meal with wine and ale served non-stop. There are scary interactive performances and even a late disco. Finally, if some Halloween events seem a little immature for you and you want something more grown-up, why not check out this Day of the Dead boat party? First of all, you’ll start your night on the pier from 6 pm where face painters and DJs will begin the celebrations. Then you’ll cruise up the river on two specially themed decks for two hours. In addition, a group of zombies and ghosts will host the party back to the Crown Pier.